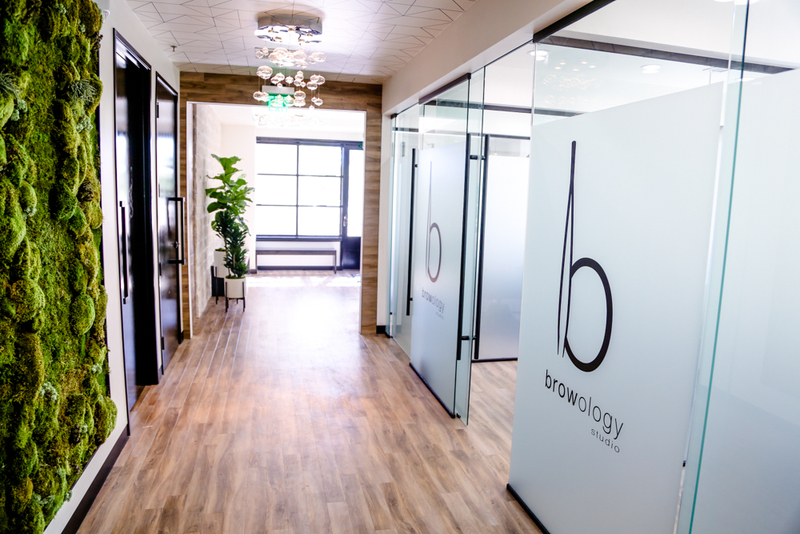 Browology Studio is a high-end, full-service waxing and skin care salon located in the Del Mar community of San Diego, CA. After spending over 15 years in the Beauty Industry as both artist and entrepreneur, owner Stephanie Bostwick felt it was time to take her business in a fresh direction by creating a new brand in a new market. Specifically, she envisioned a refined, contemporary experience that would focus primarily on superior service and unmatched expertise. Citing their strategic approach of putting the “brand” first in their design development process, Stephanie chose Retail Habitats to create an elegant and inviting space that would consistently exceed the expectations of her target Clientele. During Discovery it was determined that visitors should be treated to a comfortable environment that was “clean & professional” without being “cold or sterile.” To accomplish this, a simple black and white color pallet was juxtaposed against materials like frosted glass, wood and stone to create a minimalistic esthetic that still felt warm and inviting. Elements such as a moss accent wall, custom large-format graphics, unique light fixtures and a wall-papered ceiling were also specified to lend some all-important visual interest to the space, thus creating in an interior look and feel that exuded sophistication and natural beauty at every Client touch point. Browology Studio’s grand opening in December of 2017 received rave reviews and they continute to set the highest of standards for service, Customer experience and Client satisfaction. This article was originally posted here at Retail Habitats.